I constantly look for new ways that I can spend less time doing tedious book keeping and focus on the story or interesting encounters. One tool that has helped me do just that is Kobold Fight Club. Kobold Fight Club is an encounter builder. An encounter builder is a tool that aids the DM in creating an encounter. What that means is that it is a tool that has features that help the DM select monsters that are appropriately balanced for their party. There are plenty of encounter builders online, but Kobold Fight Club is my favorite because of all of the additional tools and information that the tool gives you. The first area we’ll look into is the Group Info section of Kobold Fight Club. On the left-hand side we will use the drop down menus to input how many players we have in the party and what their levels are. Personally I like to keep my players at the same level, but if your group does not do that you can add additional player levels and input the appropriate number of players into each category. This is important information for the tool as it will need this information to output an encounter later. On the right side of this section are the recommended experience totals for each of the difficulty levels of encounters. In 5e, there are 4 difficulty levels: Easy, Medium, Hard, and Deadly. Kobold Fight Club will update these experience totals as you change the number and levels of players. Before we move on to the next section of the tool, have a difficulty in mind for the encounter you are currently designing. Easy – Minimal risk of harm. No risk of death. Medium -Potentially dangerous. Tiny risk of death, but the party will take some damage. Hard – Dangerous. The party will take damage and expend resources. There is a real risk of death. Deadly – Extremely difficult. Risk of at least 1 death or even a total party kill (TPK). Pages 82-84 of the Dungeon Master’s Guide goes into considerably more detail should you want to learn more about encounters. I will probably be writing a post on the topic in the future as well. Now that you have the encounter’s difficulty in mind and the party’s levels and players input we can continue with building the encounter. You may already have an idea for the setting of the encounter, or you know what type of creatures you’ll want to use. You may have decided that you’d like this to have 1 or 2 high CR mobs or a lot of little mobs. Maybe you only have the Monster Manual handy and only want to use creatures in that. The great news I have for you is that you can use Kobold Fight Club’s filters to set any of these parameters that I’ve mentioned. The other great news is that if you don’t have any idea what you’d like to throw at the party, these filters are completely optional! Let’s take a deeper look into what each of the filter options are. Filter out what types of creatures you wish to include. In the search bar you can search for specific creatures or keywords such as “gnolls” or “goblins”. 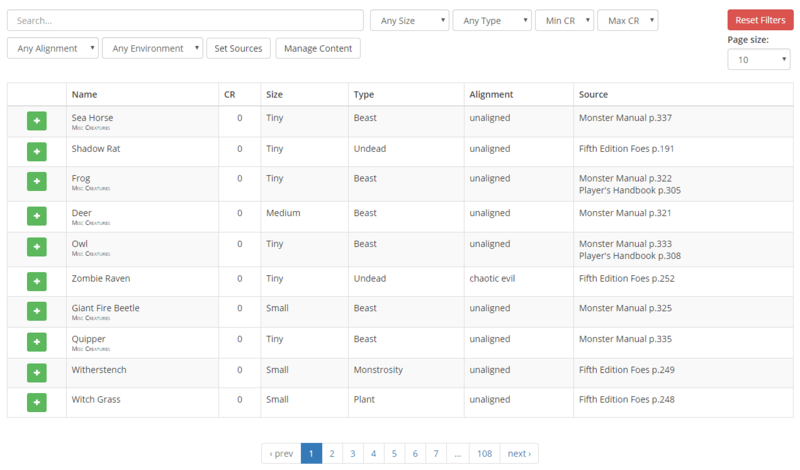 This will filter the creatures so that the available creatures fit the keywords you entered into the search bar. Sort by the size of the creatures you wish to put in the encounter. Only one size can be selected. Choose the type of creatures to include in the encounter. Only one type can be selected. Choose the minimum and/or maximum Challenge Rating for the creatures. Choose the alignment of the creatures to include in the encounter. Choose the environment that the encounter will take place in. Only creatures naturally found in this environment will be included in the list. Choose which official books or homebrews to suggest creatures from. Set the filters to their default selection. 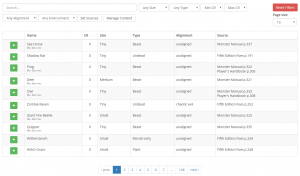 Once you have selected the filters you desire Kobold Fight Club will curate the list of available creatures that fit your criteria. 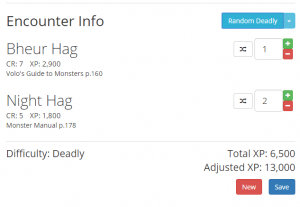 From here you can decide to either randomly generate an encounter or select creatures from the list. We’ll go over both methods as they’ll both serve a purpose for most DMs. Simply click the green “+” button to add a creature to the encounter. This will add a copy of the creature to the Encounter Info section of Kobold Fight Club. You can continue to add different creatures if you so choose. You can also use the “+” and “-” buttons next to the creatures to add or subtract more/less of that specific creature in the encounter. Click the “+” button to add a specific creature. You’ll notice in the screenshot that the different vampires in the list all have different color codes. This is to indicate how difficult the CR of the creature is in comparison to the party you have input into Kobold Fight Club. White is the least difficult while red is the highest difficulty. The difficulties between are on a scale of cool colors (blues, greens, purples) to warm colors (yellows, oranges, reds). The warmer the color, the more difficult the creature is for the party. This helps to give a visual of the encounter’s difficulty for when you are manually adding creatures to your encounter. You can randomly generate encounters from the curated list we created in the previous step. This is extremely simple to do. Simply decide what difficulty encounter you wish to create and then click the drop down menu in the Encounter Info section. Once your encounter is selected, press the button. You can continue to press the button should you wish to view different combinations of encounters from your list. Select the difficulty of the encounter then press the button. This encounter will be completely balanced for whatever difficulty you selected and ready for you to use immediately. This is very handy should you wish to drop a random encounter on the party as they travel to their destination, but don’t want to deal with random encounter tables. In the Encounter Info section, you will put any finishing touches on your encounter. Add or subtract creatures, reroll the encounter, and record the exp you’ll reward the party with if they complete the encounter here. This section gives you all of the information on the creatures you selected in a neatly-formatted package. You have the name of the creature, CR, XP value, the book it’s found in, and the page of the book it is in. This is extremely helpful especially for random encounters as it saves you time having to look up the creature’s name in the appendix of the book, or rifling through various homebrew PDFs in your files to find the correct one. Make adjustments to your encounter here and save it for later. The experience reward can be found at the bottom of the section. Total XP is the base experience of the monsters included. Adjusted XP is the experience of the encounter with respect to the number of enemies. You’ll award the Total XP to the players if they complete your encounter. You can hit the “save” button to save the encounter for later use in Kobold Fight Club. There is a Manage Encounter section of the website that stores all of your saved encounters. You can revisit these whenever you wish. Once you are ready to create a new encounter, press the “New” button. The Encounter Info section will then be cleared. Your filters will still be intact so you can quickly create another encounter of the same theme! Kobold Fight Club is by far my most-used tool in D&D 5e. I use it constantly for ensuring that encounters are properly balanced, and finding new monsters to throw at the party. I tend to stick to the Monster Manual or Volo’s Guide as I own physical copies of both of those. Because of this, it adds a lot of variety to my games as I have many books and random PDFs that I don’t always think to look through. My party of 5 players meets every week and not everyone can always make it. This can be annoying as I design the encounters in mind for 5 players, but real life can happen and we’ll be running a game with only 4 some weeks. Being able to throw all the encounters on Kobold Fight Club quickly before the game and readjusting the encounters to their proper 4 person party difficulty has been an absolute blessing. I used to have to choose between either tweaking on the fly or punish my players by forcing them to fight considerably harder encounters. One piece of advice I’ll give for using Kobold Fight Club is that you’ll want to take note of how easy each of the encounter difficulties is for your party. If your party has a lot of magical items like mine does you should compensate for that. For example, my party should be able to do 6 medium encounters. Instead, I’ll throw 6 hard encounters on the lower end of hard exp threshold at them. You’ll know what your group can handle so trust your gut.